If you have a question or need additional information, please complete the short form below and we’ll get back to you as soon as possible. The most effective floral design program in the Greater Toronto Area. As a microbiologist, my professional career is far from anything artistic but Mary gives you the confidence to do it on your own. I did the flowers for my own wedding over 7 months after taking Mary's course and she was very responsive in helping me figure out what I should order and how many based on a sample picture I showed her and the # of tables + bridesmaids I had. Absolutely no regrets and I'm just grateful I did the TFS. The course is very hands on. Almost every minute, we had our hands on flowers and practiced everything from prepping, arranging and tying off arrangements. Theory, tips and tricks were discussed as we were working on flowers so Mary wasted no time in sharing her knowledge. I wasn't stressed doing my wedding flowers as a first project because everything I needed to do was practised in class. She stands by her words when she says she's available after the course for any advice we need. You're paying for the course and the beautiful flower arrangements you get to take home but you're also getting a personal consultant to help you with your own projects...long after the course is over. Thanks a million, Mary. I couldn't have done it without you. About to start private lesson #3 and so far thoroughly enjoying being Mary's student. Laughter and learning - what could be better?! Mary is a great, and patient teacher and I'm learning a great deal. Highly recommend. The mentorship program has helped me so much with my business. They are always there and prepared to help me with anything I need. They have set me up with a wholesale account for Toronto Flower School students so finally I can buy wholesale! ....Thanks Mary! I'm missing my time with you so much. I'm waiting for the advanced classes to kick in soon. I really loved learning with you..thank you again! I just finished this course and WOW! Mary was such an amazing teacher. I learned so much and am looking forward to applying my new skills in the industry. I would recommend this course at the Toronto Flower School to anyone interested in floral design. I always have so much fun in Mary's classes! She's a great instructor. I enjoyed being Mary's student! She is a fantastic teacher who has impeccable taste. And she's a wonderful person. I looked forward to every class I had at Toronto Flower School! Thank you SO MUCH! You're the BEST! Wonderful people teaching at this school. I can't say enough! 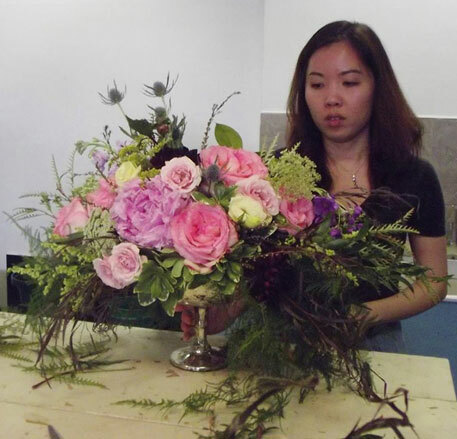 We're a Toronto flower school that teaches modern and contemporary floral design. © 2012 - 2016.Toronto Flower School. All Rights Reserved.